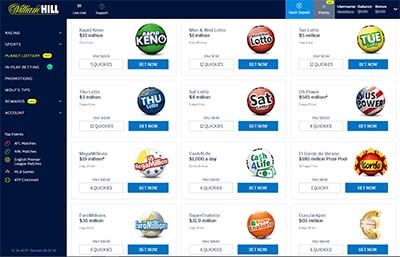 William Hill Planet Lottery is a special online lotto platform which lets Australian punters play the very best lotteries in the country and around the world effortlessly. With the flexibility afforded by this option, players can play million-dollar jackpots like the US Powerball and the Euromillions, alongside Australia’s OzLotto, Tatts Monday, Wednesday & Saturday Lotto, and Super 66 & Lucky Strike. PlanetLottery uses Lottoland’s service as an acting agent and passes on your bets to the lottery giant - our review delves into whether Planet Lottery is a service which can stand on its own two feet, or if it’s better for Aussies to bet directly on Lottoland instead. Only Australian players over the age of 18 may use and bet with William Hill Australia’s Planet Lottery platform. Unfortunately, residents of South Australia are excluded due to local state legislation (SA Lottery and Gaming Act 1936) that prohibits betting on the outcome of a lottery. Planet Lottery is an online lottery betting product rather than a lottery agency. Instead of buying tickets to a traditional lottery draw, you are betting on the outcome of the official draw via Planet Lottery, who passes on your wagers to Lottoland. However, you still pick your same lucky numbers as usual (or have them randomly picked for you) and the potential payout, handled by Lottoland, remains the exact same. 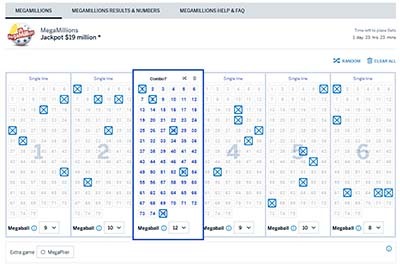 This method of lottery betting allows Australians the chance to bet on and potentially win the same life-changing jackpot amounts only available from overseas lotteries like the US Mega Millions, which often boasts over $100 million in prize money draws. While you can pretty much do the exact same thing over at Lottoland and cut out the middleman service altogether, Planet Lottery does offer convenience as a portal for all your sports, racing, novelties and lottery betting needs without the need to have a separate account or betting balance elsewhere. If you already have a William Hill account or were looking to combine your betting activities including lottery betting under one roof, give Planet Lottery a chance. Before you can use the Planet Lottery service, ensure your identification documentation and contact details have been verified by William Hill so you can withdraw any winnings with ease and without having to run around and sort out said details after the fact. From our experience with the site, Planet Lottery has an easy-to-use and easy-to-navigate interface which is straightforward and makes the lottery betting process simple. Simply login or sign up for a new account at William Hill Australia (register via our links for exclusive sign up welcome bonuses) and click the ‘Planet Lottery’ tab on the left-hand side bar. The site will then load the main lobby featuring all available lotteries currently running and displaying their current jackpot and time left until draw. Each lottery features a quick pick button and bet now button which allows you to start picking and confirming your numbers for your wager. To play, click on the lottery draw you wish to bet on and use the grid boxes to fill in your preferred numbers. The digital form automatically tallies the total cost of entry every time you fill more boxes; just click the ‘Place Bet’ button when you are done to confirm your final stake amount. Any bets you place cannot be amended or cancelled, so make sure you’re sure before wagering. After the draw results are out, check out the ‘My Bets’ section of your William Hill account to see the winning numbers and whether you scored any winners. Every lottery displays the latest results and winning numbers, schedule for the next draw, general help and FAQs and the cost to bet in a neatly wrapped interface, which we highly appreciated. We can see many people less well-versed with the Internet appreciating for its streamlining. Planet Lottery Terms and Conditions state any winnings below $100,000 will be credited in accordance with William Hill Australia’s Betting Rules and if you win over that amount, the customer service team will contact you to give you a time-frame of when you should expect your payout to reach your account. For those curious as to how Planet Lottery and Lottoland (which handles the payouts, with Planet Lottery acting as the agent and bookmaker) can truly afford to payout such huge jackpots, all winning bets made on the platform are fully guaranteed with jackpots underwritten by major insurance firms. So far, all winners over at the Lottoland platform have been paid out promptly and without problem, and seeing as how Lottoland is so heavily connected with Planet Lottery, we fully expect the same here considering William Hill’s very reputable standing. Click on the ‘My Balance’ option at the top of the page while logged into your William Hill account and then click ‘Deposit’ to see the full list of banking methods available to process your transfers. Take note that certain sign up bonuses and promotions for other parts of William Hill; (racing and sports betting) exclude deposits made via POLi or Skill, meaning you will want to consider other options if you wish to take advantage of certain free cash offers. William Hill’s Planet Lottery platform a fully licensed and regulated by the Northern Territory Racing and Gaming Commission with financial transactions protected by minimum 128-bit SSL (secure socket layer) digital encryption security, the same security systems used by banks. Their partner, Lottoland is based in the advanced gaming jurisdiction of Gibraltar while the Australian branch is licensed and regulated by the Northern Territory Government, meaning Aussies are safe when it comes to everything being above board and fair. Sign up to Planet Lottery via our links for exclusive welcome bonuses you can use across William Hill.